Min/Max Natural Gas: 4.5 to 14 in W.C.
Min/Max Liquid Propane: 10.8 to 14 in W.C.
A decorative media vessel is designed to hold glass media above the burner assembly, providing safe containment during operation. A decorative front both completes the face of the fireplace and covers internal components that would otherwise be seen. The front contains a screen to overlay the glass and prevent accidental contact burns. The Empire Forest Hills Contemporary Portrait Fireplace provides a sleek modern fireplace installation for your home. This contemporary fireplace requires a Piazza Media Vessel and your choice of decorative glass media to complete the installation. 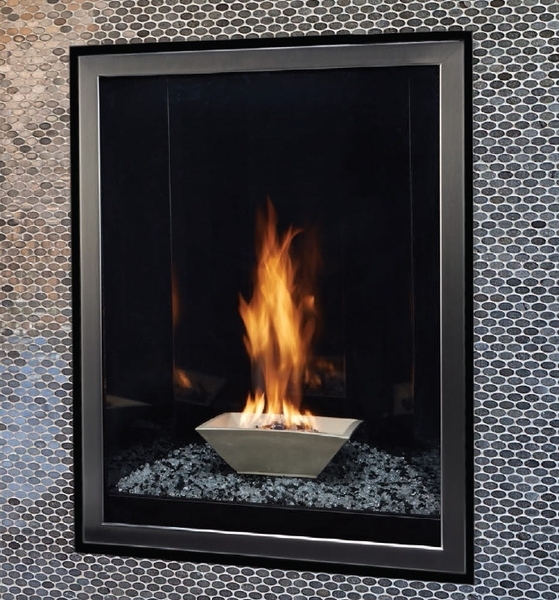 This gas burning fireplace offers a multi-function remote control, which controls flame height, independent control of the burners and the built-in dimmer lighting. The dimmer lighting comes equipped beneath the floor of the fireplace. This fireplace also requires either a barrier screen or a decorative front with screen for installation. There is an optional blower, the FBB12 unit, available. The Framing Dimensions for this unit are: 47 5/8" H x 37 7/8" W x 26" D.